IN OUR BIGGEST ISSUE OF THE YEAR! 2019 ANNUAL REPORT EARLY-BIRD SPECIAL: RESERVE SPACE BY MAY 24, 2019 AND SAVE! DON’T MISS YOUR CHANCE TO BE SEEN IN OUR MOST WIDELY READ ISSUE OF 2019, OCTOBER’S ANNUAL REPORT! 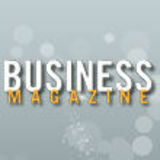 TARGETED READERSHIP: Read by more than 15,000 business leaders and decision makers. YEAR-ROUND VISIBILITY: Displayed at the Association’s Conference Center (visited by more than 25,000 people annually). Capabilities Warehousing |	Roberts	offers	uniquely	customizable	solutions	for	clients	that	have	temperature	sensitive	products,	strict	deadlines	and	large	or	small	shipments,	both	globally	and	nationwide. Roberts	currently	has	a	multitude	of	meticulously	maintained,	pest-controlled	and	heated	space	facilities	for	food	grade	products	in	Erie	County,	Pennsylvania. All	facilities	including	New	York	locations,	conveniently	located	off	Interstate	90,	are	equipped	with	a	bar	code	data	collection	system	providing	directed	pick	and	pack	location	assignment,	real-time	inventory	capability	and	a	first	in-first	out	(FIFO)	management	system. History Founded	in	1978,	the	Roberts Companies were	built	on	a	foundation	of	asset-based	local,	regional	and	over	the	road	(OTR)	units	capable	of	running	the	lower	48	states	and	eastern	Canada	with	a	compliment	of	warehouse/distribution/	cross	dock	space	in	Western	PA	and	Western	NY. Roberts	has	a	vast	pool	of	resources	and	professionally	trained	staff	to	provide	customers	with	full	Supply	Chain	Solutions. Roberts	provides	consistent	on-time	service	to	clients	through	sophisticated	management	systems,	strong	client	relations	and	a	commitment	to	excellence. Office	locations	are	in	Erie	and	Pittsburgh,	Pennsylvania,	Harford,	Connecticut	and	Charlotte,	North	Carolina	to	support	its	business	across	the	globe. www.robertstrucking.com www.rise-logistics.com Kirk Hill is the president and chief executive officer of Roberts Companies. Print Media |	To	meet	the	need	for	a	critical	service	in	the	direct	mailing	business,	Roberts	offers	print	media	and	direct	mailing	services	for	newspapers,	retail	circulars	and	mailers. With	advertisements	and	information	sharing	through	different	channels,	such	as	social	media	and	online	engagement	nowadays,	Roberts	presents	an	economical	process	to	control	cost	and	coordinate	freight	for	the	printing	industry. clients	and	the	community,”	says	President	and	CEO	Kirk	Hill. “To	build	upon	our	reputable	foundation,	we	are	strengthening	our	workforce	and	expanding	our	businesses. We	are	proud	to	introduce	Rise Logistics	as	our	sister	company! We	will	now	offer	the	same	premier services and greater resources	in	six	locations	handling	all	facets	of	supply	chain	logistics	globally. Our	Erie	office	and	headquarters	in	North	East,	Pennsylvania	deliver	services	locally	and	look	forward	to	continuing	to	do	so	as	Roberts	Companies	and	Rise	Logistics.”	Rise with Roberts, here and beyond! Trucking |	With	a	focus	on	capacity	and	reliability,	Roberts	manages	a	fleet	size	of	approximately	400	trucks	within	its	company	and	carrier	partner	networks. As	a	brokerage	firm	with	strong	relationships	with	its	clients,	as	well	as	its	carrier	partners,	Roberts	relies	upon	dependability	and	stability	to	solidify	shipper	carrier	partnerships. Logistics |	Roberts	logistics	solutions	allows	customers	to	reduce,	measure	and	control	transportation	expenditures. The	company	works	to	maintain	costs	while	providing	customized	invoicing,	auditing	and	dedicated	services	to	support	customer	business	activities. Contact us for more information or for reservations. **SPECIAL RATES IF RESERVATIONS ARE RECEIVED BY MAY 24, 2019** HURRY, SPACE IS LIMITED! 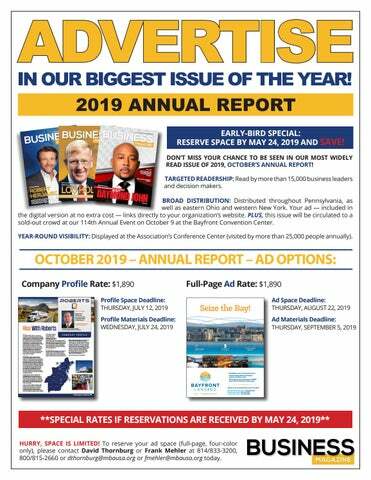 To reserve your ad space (full-page, four-color only), please contact David Thornburg or Frank Mehler at 814/833-3200, 800/815-2660 or dthornburg@mbausa.org or fmehler@mbausa.org today.